Opening June 4 at 12:01 a.m. This exhibition provides a fascinating behind-the-scenes exploration of the Oscar-winning films groundbreaking technology, special effects, costumes, jewelry and armor. 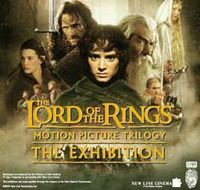 Appearing at only three U.S. venues, the exhibit immerses visitors in Middle-earth through film props, cast, crew and director interviews, and special effects. They are opening the exhibit at 12:01 a.m.-- How funny. Knowing my family, we will be there. Since I have students who still ask me for ALA Read Orlando Bloom bookmarks, I will share that Orlando has launched his "Official Orlando Bloom Website."